Somerset Wusheng Wuhan sits on a prime location along Zhongshan Avenue.Part of CapitaMall Wusheng, integrated development, the residence provides convenient access to facilities to meet your daily needs. 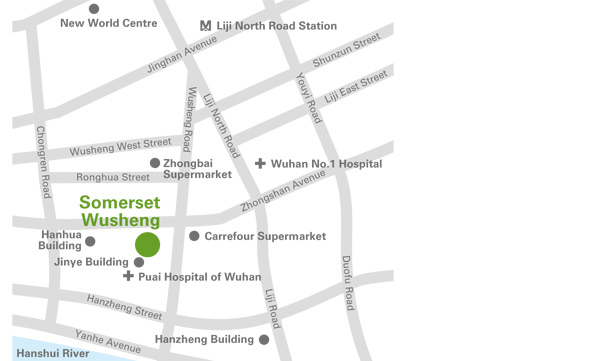 The Wuguang Commercial Hub, the largest commercial centre in Wuhan, is only a 15-minute stroll away. 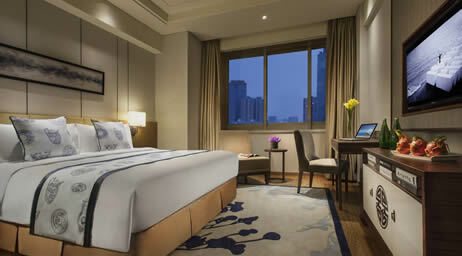 Wangjiadun central business district and the renowned Jianghan shopping street are also nearby. 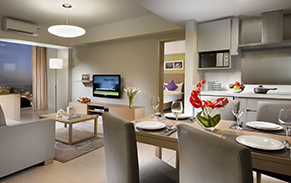 Somerset Wusheng offers 257 serviced residences, ranging from executive studios to four-bedroom apartments,each equipped with modern kitchen amenities and a spacious living area. High-speed wireless broadband access, family entertainment system and 24-hour closed circuit monitoring system also ensure a peace of mind in your home away from home. 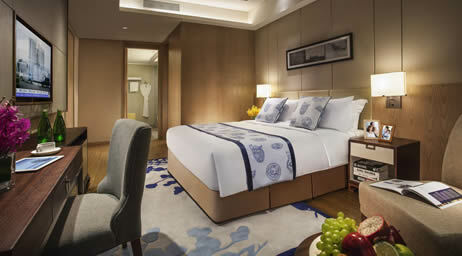 Residents can also enjoy facilities like a jacuzzi and a gymnasium. Resident activities are also lined up to help you integrate with the local community, ensuring you have a fulfilling moment in Wuhan! 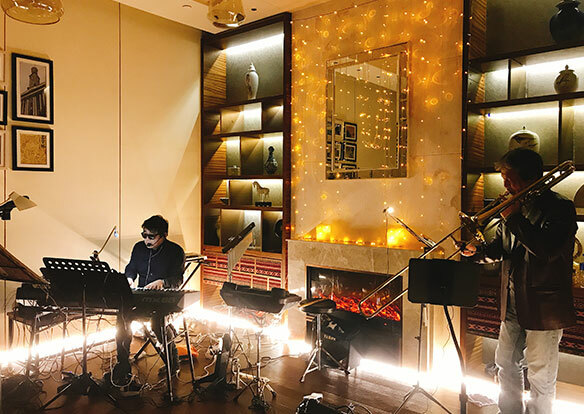 Mar.30.2019 Somerset Wusheng Wuhan Invited over than 50 Long Stay and short stay guests to joined the Earth Hour Activity, During the last Week we held Staying guest a "Wuhan In My Eyes" Photo Exhibition, The TOP 5 Pick photos were hanging in somerset Lounge in future. From 20:30-21:30 we prepared wine drinks and snacks for geusts who joined the party, Long stay and his Band Team Joined the activity , They prepared over than 10 songs performance, Because of the LSG personally join, the atmosphere was hot and specail. And at the same time, SWW shutted down all the out building and Signboard lights, Even 1st and 7th floor Lobby lights and other guest facilities lights to response the Earth Hour. 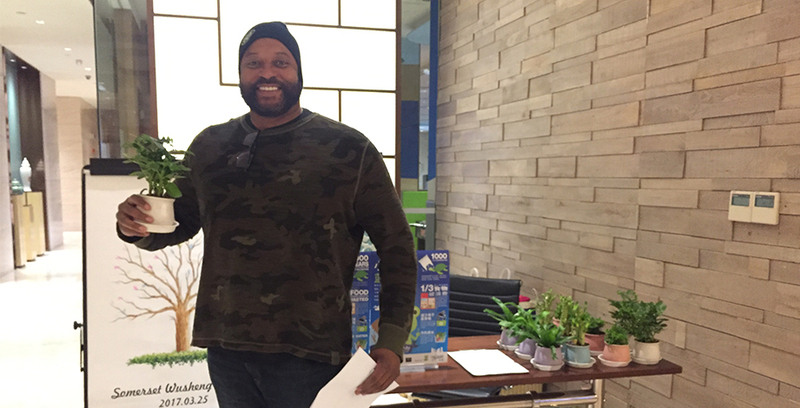 We invited long stay guests to disseminate Earth Hour 2018. At Yoga Room, we prvided balloons, glues, hemo ropes and some simple tools, we lead guest hand make some lampshades , especially children enjoyed it very much. During the moment we also prepared red wine, beers and snakes to make the event more fun. After finished we also share the balloons to children, guests also can bring the ones they make to decorate their room, such a warm Event was. Somerset WuSheng Wuhan follow the Earth Hour 2018 project, at 20:30pm-21:30pm. We turned off all the public area and building operation Lights, we purpose to pass our environmental awarenss to all of our Somerset Wusheng Wuhan inhouse guests and society. 1 week aga we already sent letter to all the long stay guests also hang the Event Posters at lobby and lift, most of guest were not only did not complaint public area dark, but also follow our steps switch off their own room to join the Earth Hour 2018. 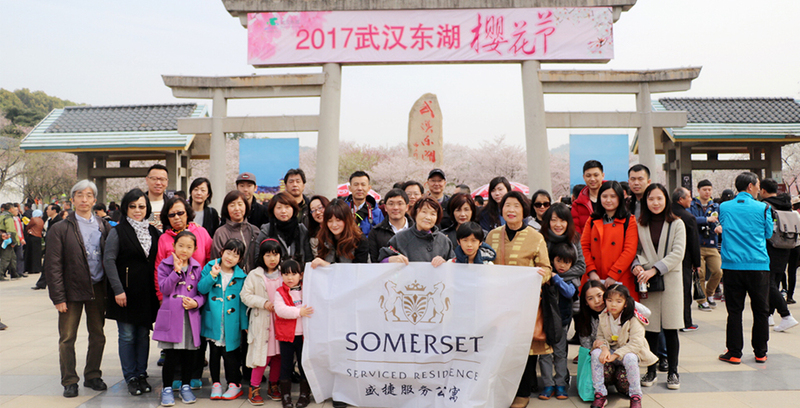 As the lanterns Festiveal approach, Somerset Wusheng Wuhan, prepared traditional Chinese New Year party for in house guests, we invited all the long stay and important guests to join. 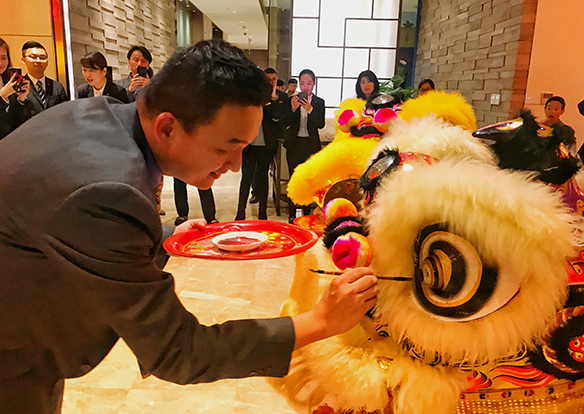 We organized 1 lion dance team，two folk artists for Sugar-art and clay figurine-art, made foreigner guests to know and feel the traditional culture, also invited a Chinese Dulcimer player to make the New Year atmosphere more turly. Management prepared dumplings and glue puddings for guests dinner, all the staffs joined making process, we made all the food by our hands and with our hearts. also left some foods for guest making experience. Nice food and diversified experiences, Hole night made guests happy and warm. From the guests' replied, It was such a good event. As a city’s character of Wuhan, Sakura has been became one of the most famous landscape. Wuhan East Lake Sakura Park is bracketed with Hirosaki City Sakura Park (Japan) and Washington DC Sakura Park as 3 best Sakura parks all over the world. Our Sakura Tour got a very positive respond, especially for those Japanese guests. It seems like return to their hometown. 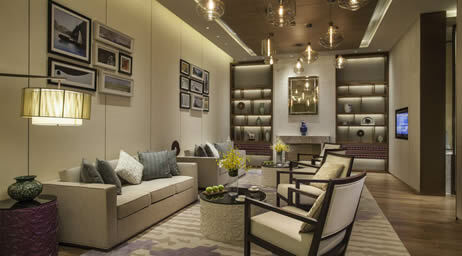 Somerset Wusheng Wuhan set an Earth Day corner at lobby and publicized the meaning of Earth Day to all our guests. Invited them to join the Earth Hour by switch off the lights in their room between 8:30pm and 9:30pm. 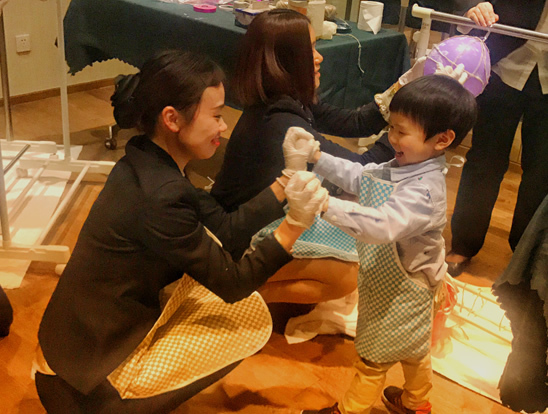 At the same time, an activity of used clothes recycling was in progress, which was very popular, our guests can bring their used clothed to exchange a plant. 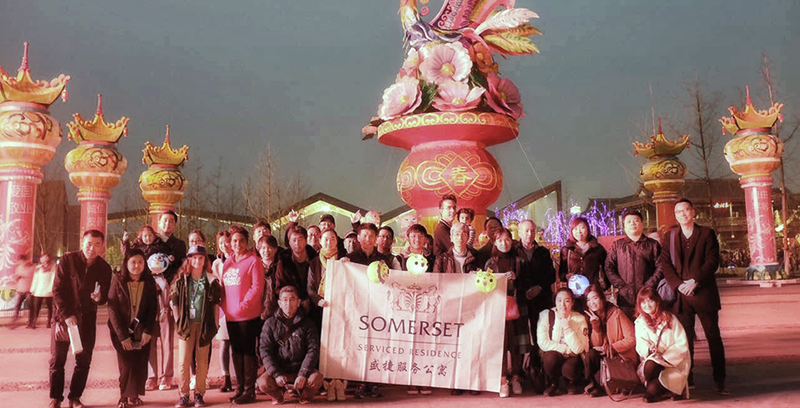 Somerset Wusheng Wuhan organized a Lantern Festival Tour for our long stay guests. Although the festival was passed, we still got a pretty enthusiastic response. It brought a different experience to watch lanterns at this warm early Spring but not during cold winter time. Hosts accompanied together and introduced the lanterns stories, especially for the foreign guests, help them to know what the lanterns exactly mean. Limo: CNY 400-800 | Maximum 4 persons | 40-minute drive, available 24 hours | Advanced booking required.